A lot of technology newbies want to be Network Engineers right out of the gate these days but there are valuable lessons that you can learn from starting out at the Desktop Support role and working your way up. The rewards of being a Network Engineer is great but if you don’t understand how a computer functions and talks to a Server, Domain Controller, DNS Server, etc. then how are you supposed to troubleshoot a potential network issue? I’d like to share some insight and take you through some life experiences I learned along the way to becoming a Network Engineer today. To begin with, how many people who are Network Engineers have built a desktop from the ground up? I don’t mean popping a disk in and going through the pre-directed menus to set your preferences on time-zone, computer name, etc. I mean truly crack the case open and understanding the components that make up a computer. The RAM, hard drive, power supply, types of PCI expansion slots, and Video Card. Most Engineers that I meet and talk with start studying Cisco Day 1 and try to get certified to get a job. While there is nothing wrong with this there are valuable steps that are missed by not understanding how a desktop works, how a server works, how storage stores files, and how the network can affect all of this communication. At the end of the day Network Engineers must be able to build and maintain the highway that all the components talk with. I like to use the analogy of a highway; I am going to build a highway, but to build that highway I must understand what is going to be moving over that highway. What if there are problems with certain cars that go down that highway? How do I fix their problems? Without knowing something about how that car drives on the highway and where it’s trying to go I am unable to fix any problems. Let me take you back early in my career. Coming from a generation that started out with Windows 3.1 and having to understand that drivers for components really meant something as to how the computer functions you must really understand what you are doing or there is no boot process taking place. I used to think to myself this is horrible and why couldn’t the process of building a PC be any easier. What I didn’t realize at the time was that all the processes I was going through was a life learning experience in troubleshooting. It took patience (lots of patience) because with different processor chipsets you had different challenges. 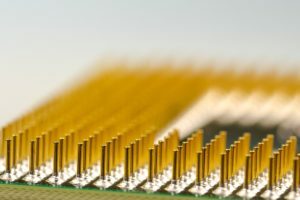 Hard Drives for example use to have pin connectors (Exhibit A) that were bridged together to specify if a hard drive was the primary, secondary, or stand alone. Then there was the process of building the machine with an operating system once it would boot properly. I remember the days that all you needed to install the operating system was to have DOS installed….yes DOS. Once DOS was installed then you had a set of Diskettes to load the operating system. Once everything moved to Windows 95 (A, B, or C) and before CD Drives existed the entire operating system (OS) was loaded with 25 Diskette drives….one after one asking for the next one to be inserted! You could only hope that one of the diskettes was not corrupt along the way! So why am I telling you all of this? Well I want to share this because I think the time spent forcibly learning and installing all these components has stuck with me through the years. The tasks you think are the worst or the most cumbersome at times are the ones that later in life you look back at and realize are what has helped you the most in your career. As younger generations enter the work force the pace is moving faster with everything expected to arrive instantaneously. The challenge for Network Engineers today is to solve the problem in minutes… not days or weeks. The progression of learning from the ground up builds a foundation of understanding how everything works in a connected World. No matter what desktop your talking about, server platform, Internet connection, storage platform, all the base connectivity with how each layer interacts between one another is still the same with some minor differences here and there. 1. What happens when one desktop can get to a network share, but others cannot? 2. What happens when all users can get to one website, and others cannot? 3. How do you approach figuring out the solution to the problem? Having the comprehensive knowledge and ability to troubleshoot is what sets apart a Network Engineer. The time spent learning and developing skills to understand and troubleshoot the little things is what makes a World Class Engineer. In addition to being a World Class Network Engineer, it will make your job a LOT easier in the long run. Now I’m not saying that everything is going to be easy to figure out but as you figure out how to troubleshoot issues you will start to remember things you encountered along the way and everything will start to add up. I don’t want everyone to think that they MUST work in Desktop Support and then work their way up, but I just wanted to say that in my career I started out in Desktop Support, worked my way into understanding Servers, then built Servers (File Servers, Fax Servers, Domain Controllers, Print Servers, etc), after which I started my certifications into Microsoft (MCSE NT 4.0). From Microsoft I started learning about storage; specifically high end storage with Fiber Channel (McData Switches). I also mastered how mass storage drives worked on the network with Clarion, LSI Logic, and others. After all this experience, I then decided I needed to progress to the network side to see what makes all this work; that is when I decided to start my career into Cisco. Understanding how all these components work with one another made learning networking very simple as a natural progression for my career. What was even easier was the ability to troubleshoot issues when they popped up which I attribute all my previous hands on experience with various systems that run and function on a network! What is your takeaway from all of this? It’s not how fast you can get your Cisco Certification or industry Networking Certification and getting a job working in networking as a Network Engineer that will make you valuable. It’s the understanding, communication with the customer, and troubleshooting experience you bring to the table plus being able to get a network, email, Internet, or users back online with little hesitation. As a Network Engineer there shouldn’t be a DMARC for where you stop troubleshooting. Step out of your comfort level and troubleshoot whatever comes your way if the opportunity presents itself. You’ll be glad you did later down the road. Whatever you do don’t stop learning!